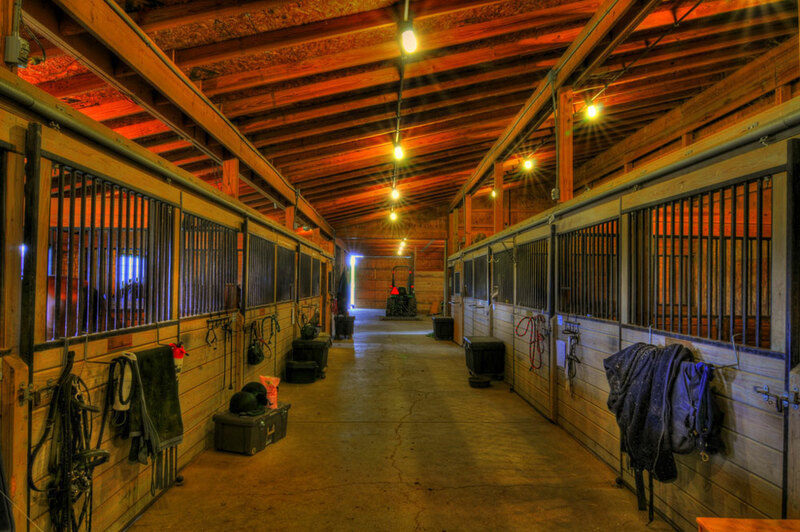 How to get in better shape without ever leaving the barn. For those of us in the colder climates, winter can be a bummer. We find ourselves spending more time indoors. Because we’re not riding as much, we struggle to find ways to spend time with our horses during the winter when we feel the pull to hit the gym. As always, it’s important to warm up before starting any physical activity. 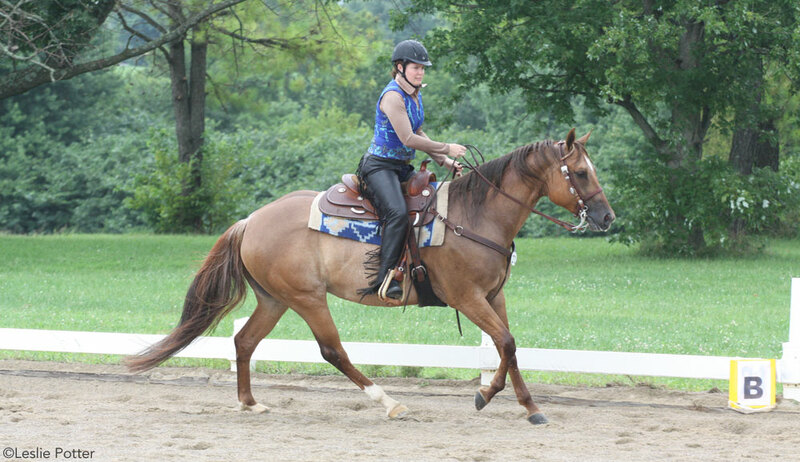 Getting the blood pumping and your heart rate up is easy in the barn aisle—start with some body weight exercises that are sure to make your horse question your sanity. Once you’ve completed that, it’s time to assemble the equipment. Barn aisle workouts are meant to incorporate things you’ll find in any barn, but if you don’t happen to have one of these items available, use your imagination with another item (i.e., stretching out a lead rope over your head instead of using a pitchfork for the overhead squats). Incorporate any of these moves for a cohesive, heart-pumping workout to break a sweat while hanging out in the barn aisle. Hold one water bucket in each hand, filled partway with water (to avoid splashing on yourself and all over the aisle). Start at one end of the barn aisle and walk down at a quick pace. If this seems too easy, fill the buckets with something solid, such as grain, salt blocks, et cetera. Place an empty water bucket upside down and stand in front. With your feet shoulder-width apart, squat down, keeping your knees straight forward and bringing your arms straight forward for balance. If you can, squat until your bottom slightly touches the water bucket, then stand up. If you can’t go that low, that’s OK—go as far down as you can and then straight up. The water bucket is your goal in squat depth. To keep your pants clean, perform your push-ups on a sturdy hay bale. I’d recommend having the hay bale set against a wall for extra support. You can also push off a closed stall door or mounting block. Keep your feet and toes together, straight back and core engaged. Standing in front of a hay bale (or mounting block), you will alternate lifting your knees and touching your toes to the top edge of the hay bale. It’s like you’re doing high knees in place, but aiming to touch the hay bale, much like the soccer move of toe touches on the soccer ball. Use your arms to pump to keep the speed up. Hold one water bucket in each hand with some weight in it (water, grain, salt blocks, et cetera), with the buckets at the side of your feet. Bend your knees to do a slight squat so the buckets hit the ground, then straighten up your body to lift them. Perform this action slowly and add weight if necessary. Again in push-up position on the hay bale (or mounting block), bring one knee to your chest, then switch, performing elevated mountain climbers. Be sure to keep your back and arms straight and engage your core. With the hay bale braced against a wall (or use a mounting block), alternate stepping up on the top with one leg, then stepping down. You can increase intensity by bringing the opposite knee up at the top, increasing the speed, adding weight in your hands (mini salt blocks work well), or even performing box jumps up onto the bale or step if it is sturdy. Holding a pitchfork (or stretched-out lead rope) overhead, with hands just a little wider than shoulder-width apart and feet a little wider than hip-width apart, engage your core and squat down. Holding your hands in this position adds a new challenge because you’re working on flexibility of your shoulders, balance and core strength, as well as the typical squat targets. Start at one end of the barn aisle, place your hands on your hips, and perform walking lunges down and back. Make sure your upper body is straight (core engaged, again) and that your knee does not bend past your toes when going down. To increase intensity, add weight in each hand with arms down by your sides. Another heart pumper! Stand facing a wall and raise your arms above your head. Pick a spot on the wall a little taller than your arms and then jump to touch. Continually hop on your toes looking at that spot for 30 seconds at a time. You can use a piece of duct tape to make a mark to aim for. A regular fitness routine will give you a leg up in the spring and throughout the show season ahead. Choose all or some of these exercises and create your own workout. I would recommend mixing a fast-paced exercise (such as the mountain climbers, wall touches or step ups) with a weight-bearing exercise. Try to make it through at least 10 minutes, then increase your time. Take it to the next level and invite riding buddies to workout alongside you. Try timing your workouts and have a barn competition. Make it fun to make barn fitness something for everyone so you’re ready to hit the saddle come spring!